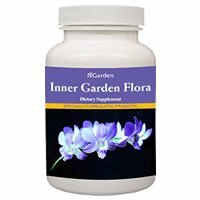 Detailed review of R-Garden Inner Garden Flora Probiotic. See how this probiotic supplement compares against all the others! Overall, at 2.5 out of 5 stars, R-Garden Inner Garden Flora Probiotic is an average daily probiotic. The directions say to take one to two capsules on an empty stomach with a large glass of water. What I like about Inner Garden Flora Probiotic is that the capsules are vegetarian and NON-GMO. I also like how affordable this probiotic is. It only costs $21 and can last up to 3+ months. The supplement also contains inulin, which is a prebiotic. I love this addition because prebiotics help feed the probiotic and keep them alive longer. This probiotic needs to be refrigerated at all times. I honestly am not a fan of these probiotics because they are so unstable. You also can never be sure if it was refrigerated whiling being shipped or delivered. There’s nothing worse than buying a big bottle of dead bacteria. I also think there are too many probiotic strains. This probiotic has 11 strains which can often times lead to uncomfortable side effects. Speaking of side effects, this is another downfall with this probiotic. I got side effects when first taking it and the product even warns that you may experience constipation or diarrhea at the start of taking them. Overall, at 2.5 out of 5 stars, R-Garden Inner Garden Flora Probiotic is an average daily probiotic because it’s vegetarian, free of GMOs, and affordable but it needs to be refrigerated at all times, can cause side effects, and uses too many probiotic strains. R-Garden Inner Garden Flora Probiotic has 10 billion CFUs in 11 different probiotic strains. Of note, I like the use of Lactobacillus acidophilus because it’s one of the most commonly used strains. This particular strain seems to help with Irritable Bowel Syndrome (IBS), bloating, constipation, diarrhea, and especially diarrhea associated with antibiotic use. Lactobacillus acidophilus may also help treat or prevent vaginal infections. Another strain in the probiotic lineup is Lactobacillus casei. I’m actually not a fan of this specific strain. Lactobacillus casei has been shown to be fairly aggressive in the sense that it can overrun the “good” probiotics by occupying areas that other probiotics might have taken in the body. The goal of supplementing with probiotics is to balance out the good and bad bacteria in the body, not make it harder for the good bacteria to live. R-Garden Inner Garden Flora Probiotic doesn’t list any major allergy concerns. The capsules are vegetarian and GMO free, which are nice little perks. The other ingredients include: cellulose (capsule) and vegetable stearate. For a 100 capsule bottle lasting 50 – 100 days, the cost is $21.00. Depending on if you take the probiotic once or twice a day, it ends up costing $0.21 – $0.42 a day. This is a good value for the product you’re getting. The overall and daily cost for this probiotic is pretty affordable, which is nice. I did get some belly pain when first taking this probiotic. I noticed some cramping and discomfort. The side effects did go away after a few days, so that was good. Remember that this probiotic has 11 probiotic strains, which is excessive for a daily probiotic. Too many strains can lead to uncomfortable side effects. The company even warns that you may initially experience constipation or diarrhea when first taking this probiotic. R-Garden doesn’t provide any sort of satisfaction or money back guarantee for Inner Garden Flora Probiotic. This is unfortunate because I really like when companies can offer something to their customers. R-Garden does have a 30 – 90 day return policy for their products. For open bottles, only one refund will be given per product. Also, keep in mind that R-Garden doesn’t refund any shipping or handling. To buy R-Garden Inner Garden Flora Probiotic, click here.